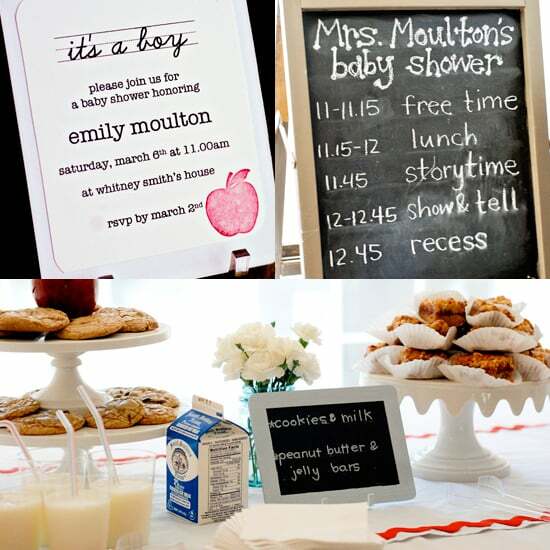 Moms-to-be love to be showered with love — and lots of baby gear — at their baby showers, and we've discovered themes to suit every expectant mom's interest. 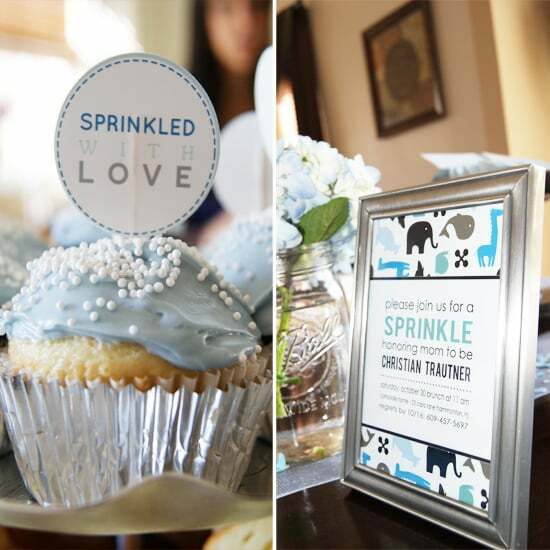 From celebrations inspired by baby animals, classic storybooks, and vintage finds to sprinkles for experienced moms and gender-reveal parties for mamas who want to add even more excitement to their showers, these 65 amazing ideas are sure to please everyone on your guest list, including the mom-to-be! Keep clicking to find the shower that speaks to you! 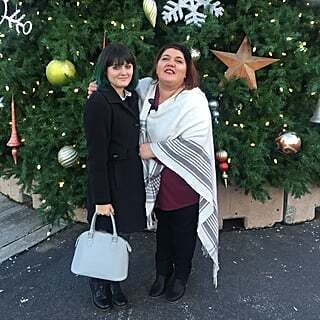 When Jeni Maus, owner of vintage rental company Found in Orange County, found out her good friend and co-worker Allison Howell was expecting, there was no question who was planning her shower, but Allison couldn't have expected how insanely awesome the event would turn out. "My favorite foods, people, superfun decor . . . ," Allison says. "I mean, she created a whole wall inspired by a print I had picked for my baby's art gallery!" 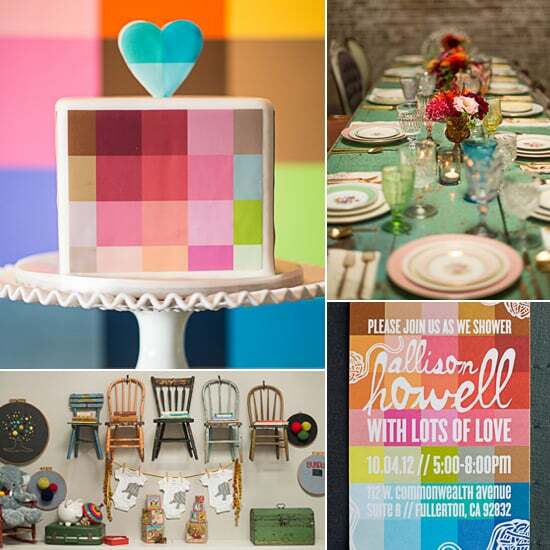 That wall was just one of many standout decor items, which also included an amazing DIY yarn chandelier and cool colorblocked invites and a matching cake. Whether or not you were an avid reader before baby, books will become a big part of your post-lil-one life. 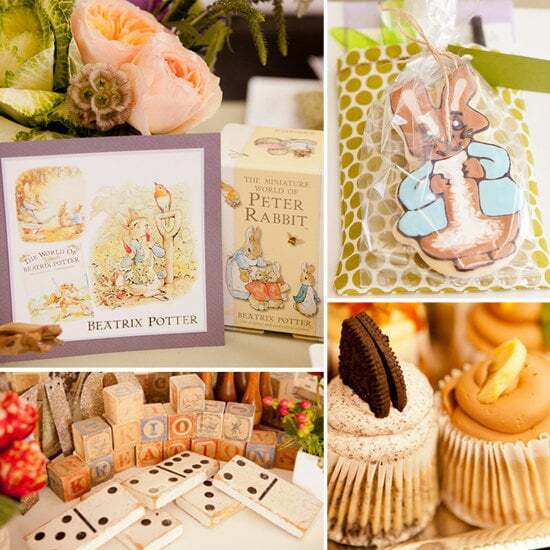 Classic books, like The Velveteen Rabbit still line many babies' bookshelves and serves as a great jumping off point for a baby shower. 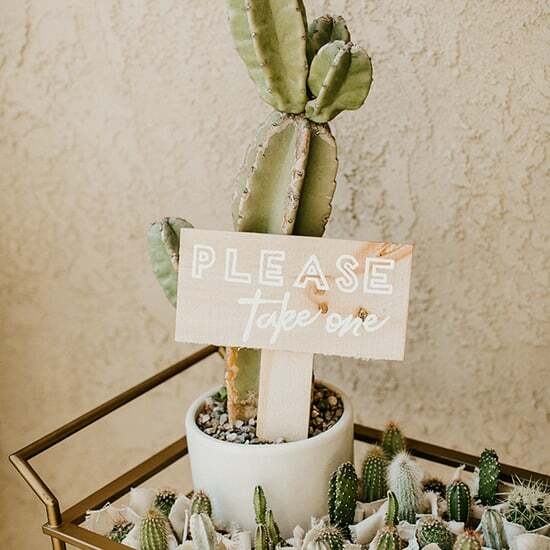 Leila Lewis of Inspired By This definitely thought outside of the box when it came time to plan a shower for her good friend Carissa Jones of floral and event styling company JL Designs. The theme: Space Invaders (quite appropriate, if you think about it, right?). 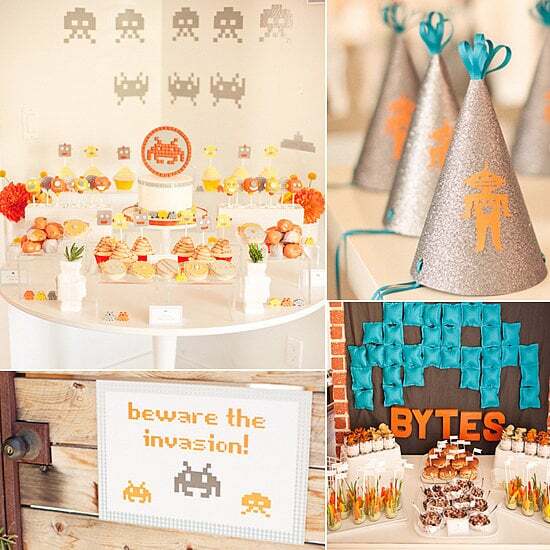 From that jumping off point, Leila created one of the most inventive baby showers we've ever seen, somehow making old-school robots look modern, cute, and totally baby shower-friendly. 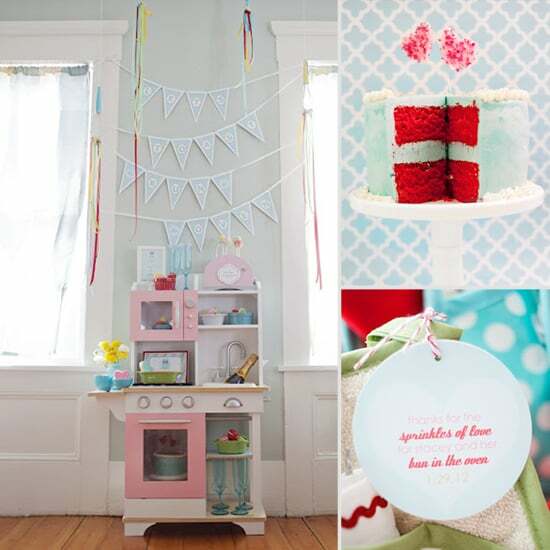 Using a vintage toy kitchen (a gift for the baby-to-be) and full-size baking tools as shower decor; adorable and cleverly worded paper goods; and a sweet aqua-and-red color scheme that translated beautifully into an aqua red velvet cake, this bun in the oven shower is perfect for the lil baker in your life. While this shower totally makes sense for a professional baker, we think it would work equally well for any mom-to-be who loves baked goods — in other words, pretty much every mom-to-be! 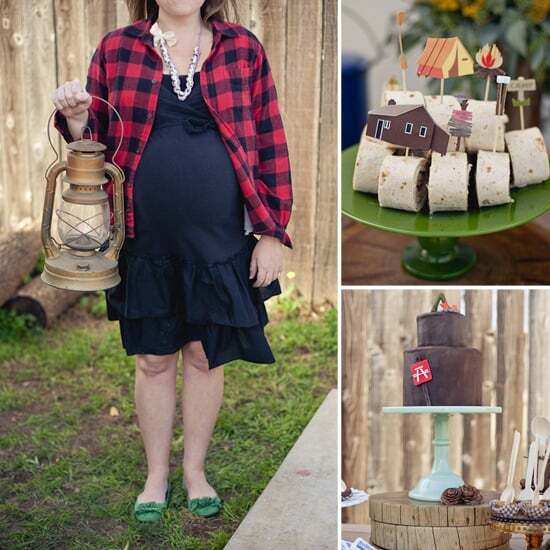 Take your baby shower outdoors with a Camping-Themed Baby Shower and celebrate mama-to-be with a rust bash! This "Hooray for Baby" shower thrown by Becca Gorski of Cake Events for three of her friends who all happened to be pregnant at the same time (don't you just love that?!) is one of our all-time favorite gender-neutral showers. "The 'Hooray for Baby!' theme started as the subject of an e-mail I sent wishing them congratulations," Becca says. "The more I thought on it, the more it felt like the perfect concept for a shower. 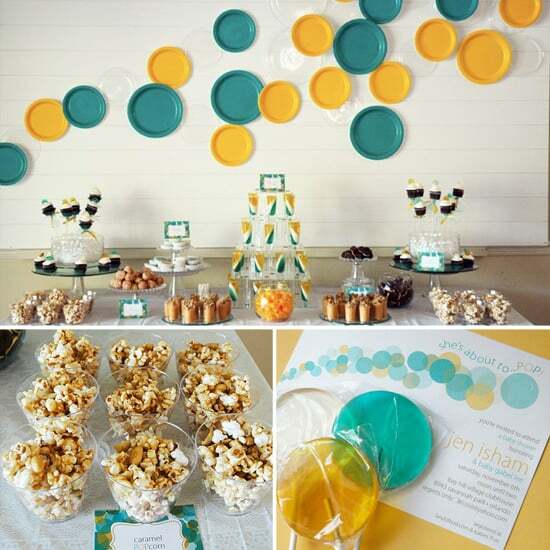 I picked a gender-neutral palette of mint green and yellow." 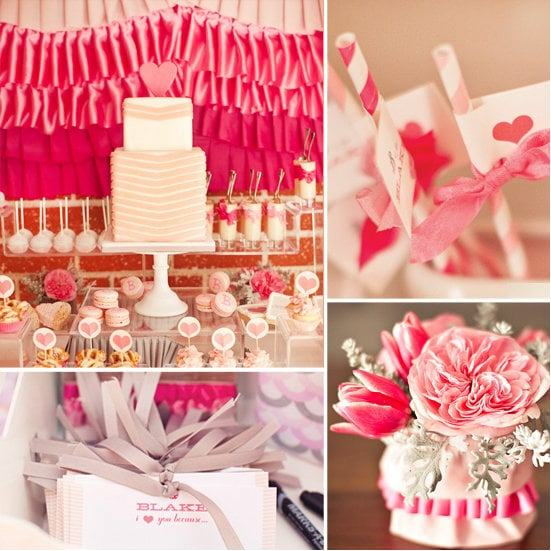 The combination of the pastel color palette and the exuberant theme makes for a supersweet combo. 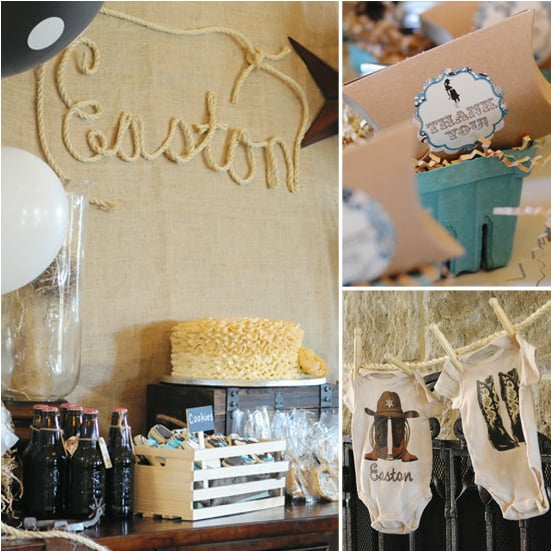 This Western-themed, turquoise-and-black-toned shower is stuffed full of thoughtful details — from a cowboy diaper cake and braided rope sign to tons of sweets and amazing signage. 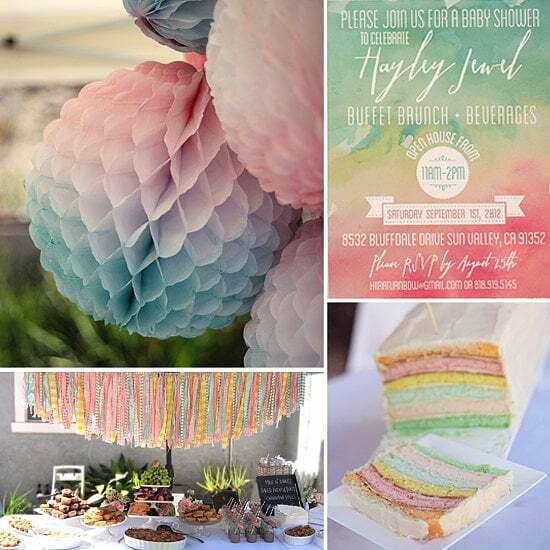 "When you have a gorgeous and glamorous friend named Tiffany who just so happens to be expecting a baby boy, hosting a 'Breakfast With Tiffany' baby shower is a no-brainer," says Jen Carver, the party guru behind Banner Events. To make her vision come to life, Jen recruited some of the best party minds in the business, including 4 Kids Cakes, which provided a beautiful, totally impressive flower-box-esque creation. A breakfast-food buffet, a cute diaper cake, and so much more made this one of the most detail-filled showers we've ever seen. 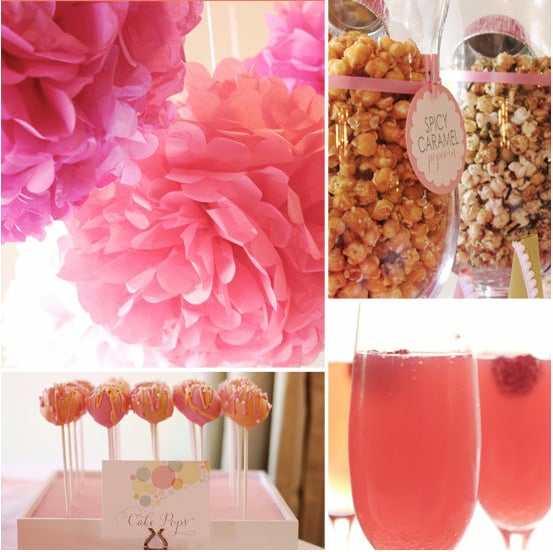 This pink- and pop-filled baby shower, is packed with creative "pop" ideas ranging from mini champagne bottles to popcorn to the ever-popular cake pops. It has high impact, but — the part we really love — it's pretty easy to re-create! While a heavy-on-the-dessert lunch might be your typical baby shower meal, we're loving this breakfast-themed party as a fun alternative. 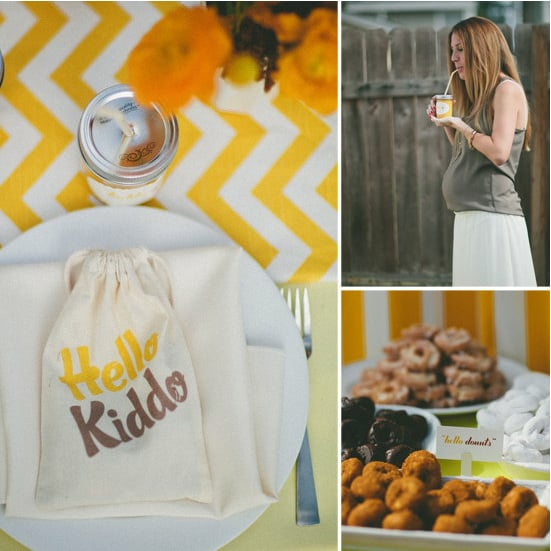 Inspired by phrase "Hello, Kiddo," the morning affair featured a heavy dose of sunny yellow fabrics, golden flowers, and of course, orange juice, along with an omelet bar, kid-inspired foods, sweet signage, and a cute activity that would please even the most shower-game averse friend. We're completely enamored with this sip and see's Welcome to the World theme. 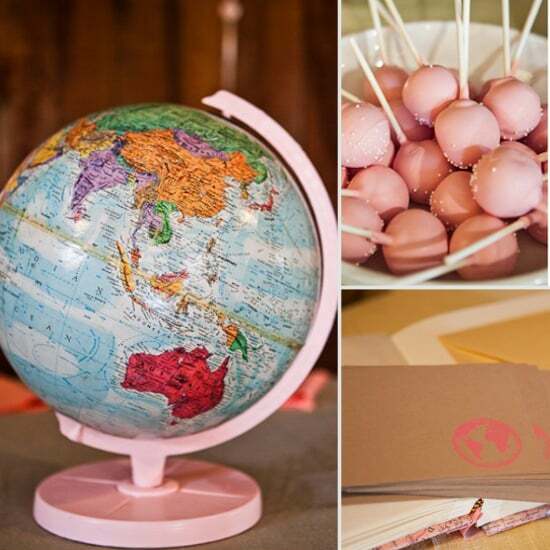 A host of stylish vintage maps and globes, hanging map mobiles and garland, colorful globe centerpieces, travel-stamped suitcases, and a beautiful handmade guest book covered in a world map — not to mention the gorgeous venue — are just a few of the details we're loving. This adorable shower is a special delivery: airmail! 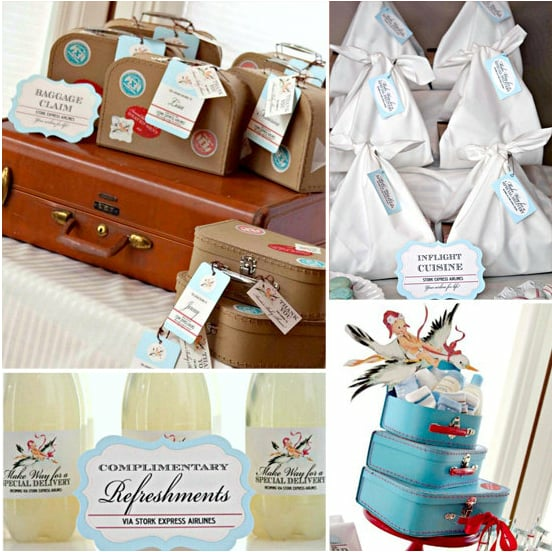 Taking vintage elements to a high-flying level, the airplane-themed shower incorporated airline-themed food, luggage, and more — think pretzel and peanut bags, baggage claim gift bags, "in-flight" cuisine boxed and tied for easy stork access! 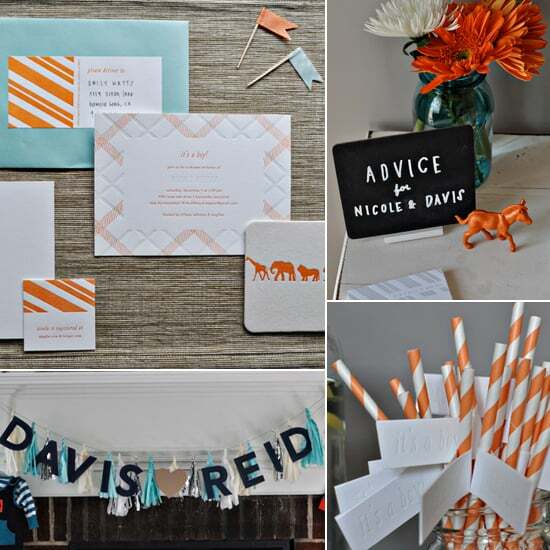 Maddy Hague of Somewhere Splendid put together this showstopping baby shower inspiration shoot with gorgeous invitations, a bold, modern color scheme, and some seriously awesome details (gilded animals! confetti notebooks! metallic balloons with fringed streamers!). Forget light pink and baby blue! 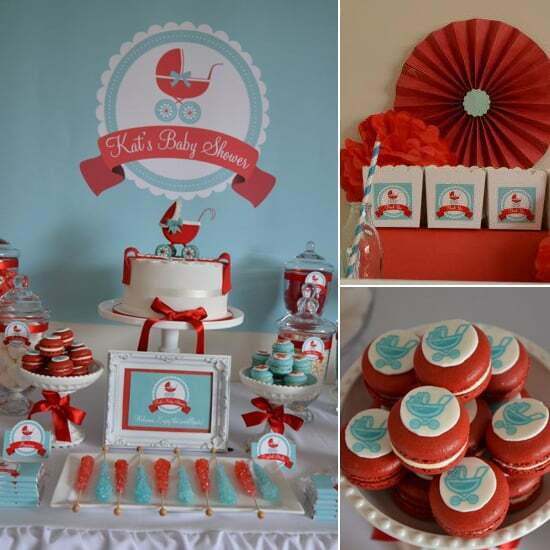 We're loving the combination of bold red and aqua used in this baby-carriage-inspired shower, thrown by Maja Ristevska of Sugar Coated Candy & Dessert Buffets. 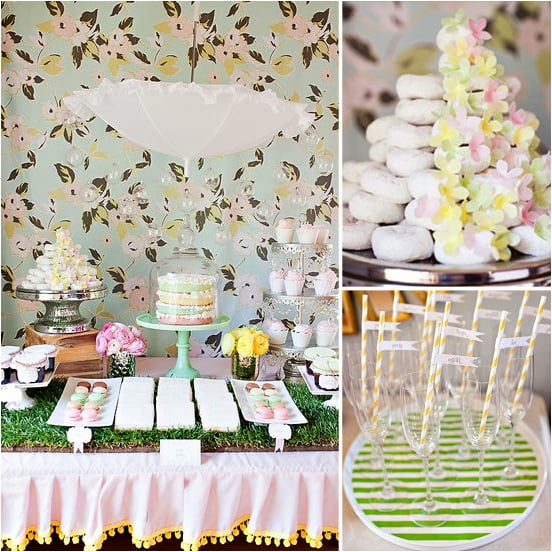 Maja created a stylish, gender-neutral shower with sweet treats and a bold color scheme. 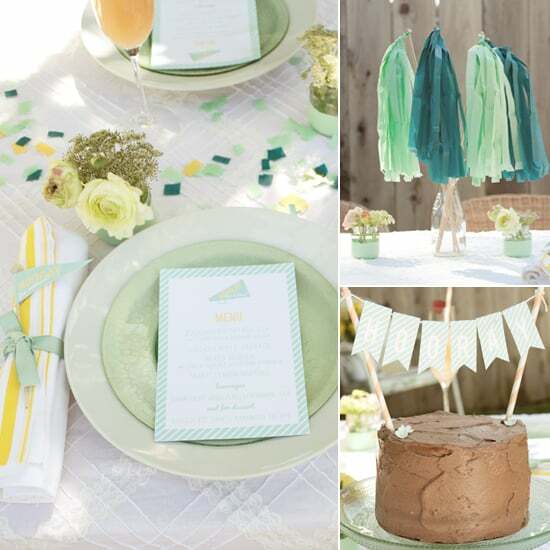 "I think it works perfectly for a different take on a gender-neutral baby shower," she says. We agree, and you will, too, after you check out the awesome details! 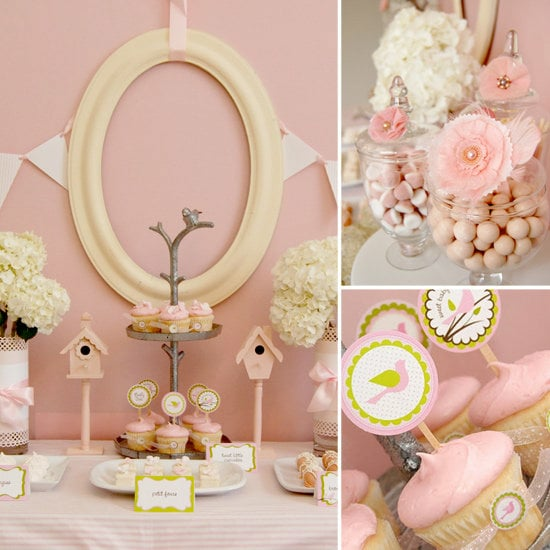 This Little Pink Birdies-themed baby shower is packed with stunning details sure to inspire. This ruffle- and ribbon-filled shower thrown for a pastry chef just might take the cake in terms of cuteness. 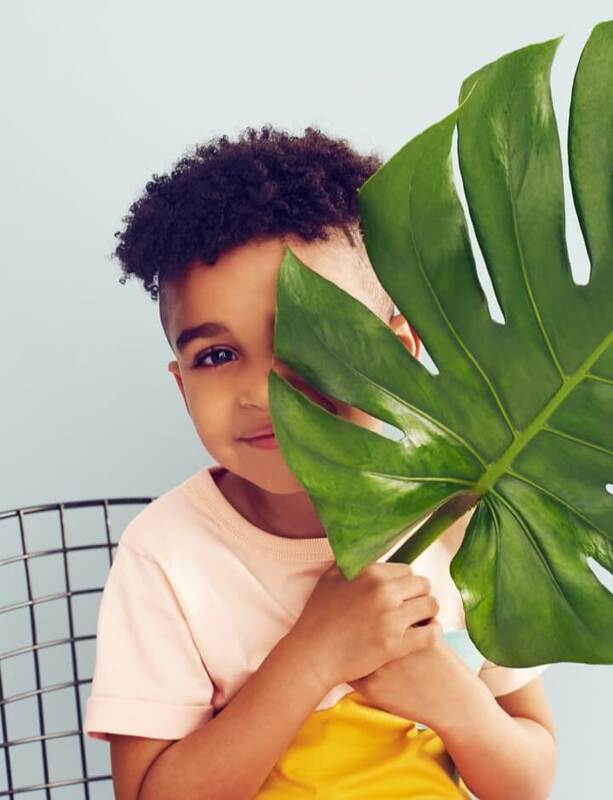 Summer Watkins, the stylish mind behind Grey Likes Weddings and Grey Likes Baby, is inundated with some of the most beautiful events out there, so when it came time to throw a baby shower of her own, celebrating her sister Brittany, it had to be a showstopper. Summer partnered with tableware company Casa de Perrin to craft an old-world, romantic concept, full of tulle and sequin table linens, antique Persian rugs, and gorgeous blooms. 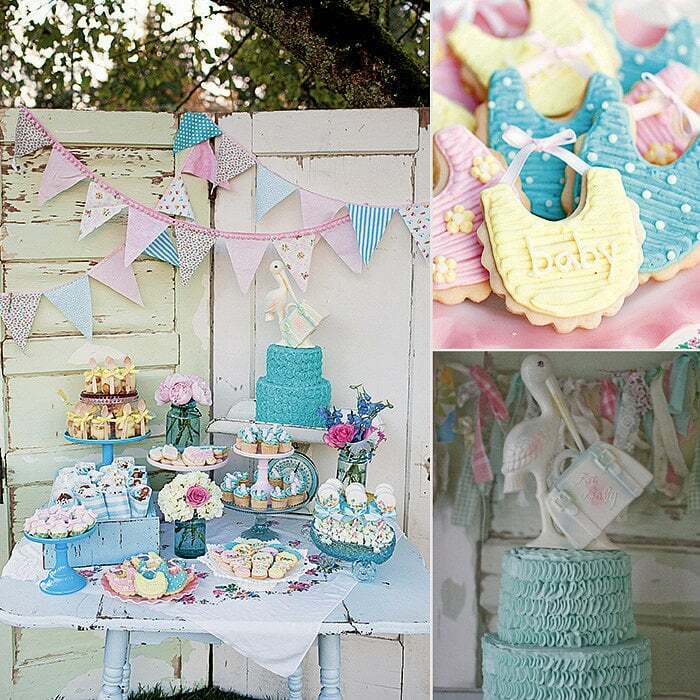 A sweet and savory biscuit bar and a gorgeous cake made by the grandma-to-be are just two more ">must-see elements at this baby shower. Lullabies may be designed to send your baby off to dream land, but this lullaby-themed shower is anything but sleepy. The party was inspired by a vintage lamb planter the dad-to-be's father gave to his mom the day he was born, along with a Cuban lullaby his mom sang to him when he was a baby. 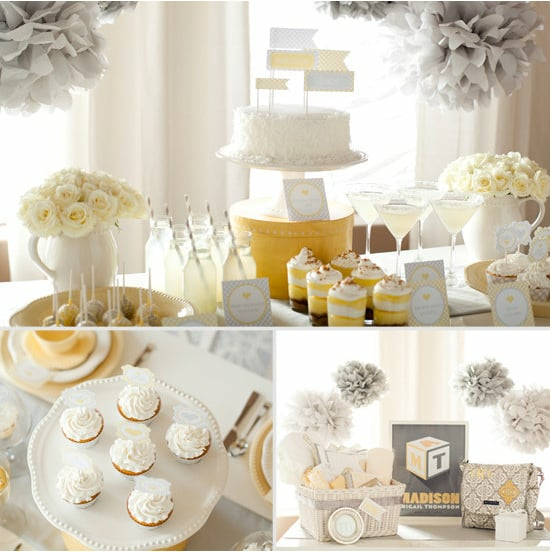 A sleigh-crib dessert table, Cuban desserts and Vietnamese food (celebrating the parents-to-be's heritage), as well as an abundance of clouds, stars, and sweet lambs add to the shower's lullaby appeal. 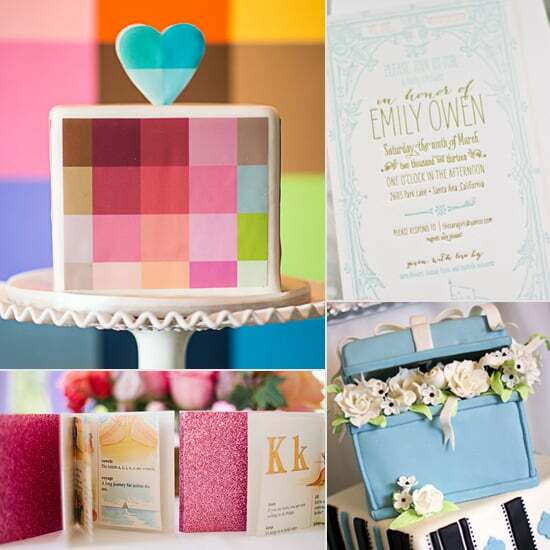 We've been obsessed with Wiley Valentine's gorgeous paper products from first sight, so it's no surprise that we're over the moon about the adorable baby shower thrown for Wiley Valentine cofounder Emily Owen by her business partner and friend, Rachelle Schwartz. 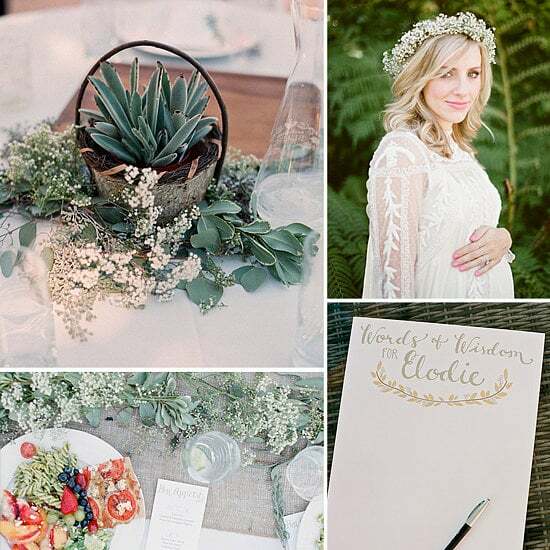 "Emily's style is understated vintage with tiny hints of whimsy. 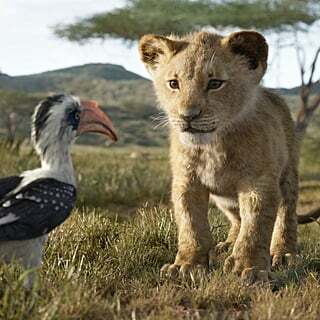 She absolutely adores animals, so I knew we had to incorporate animals into the shower," Rachelle says. "Rather than doing games, we had interactive stations such as a tea bar and the DIY mobile station." There are so many inspirational elements of this shower, including, of course, the awesome Wiley Valentine invitations. 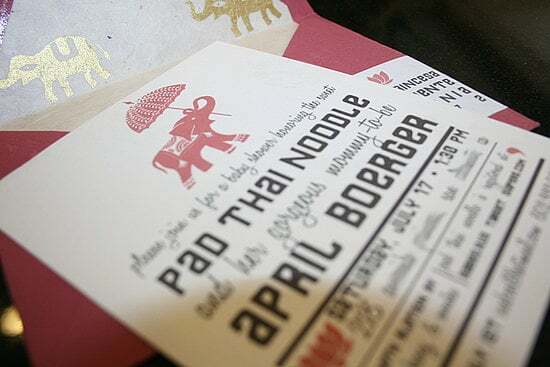 When a mommy-to-be got pregnant on a trip to Thailand, her friends jumped on the international theme and planned a Thai-themed shower. 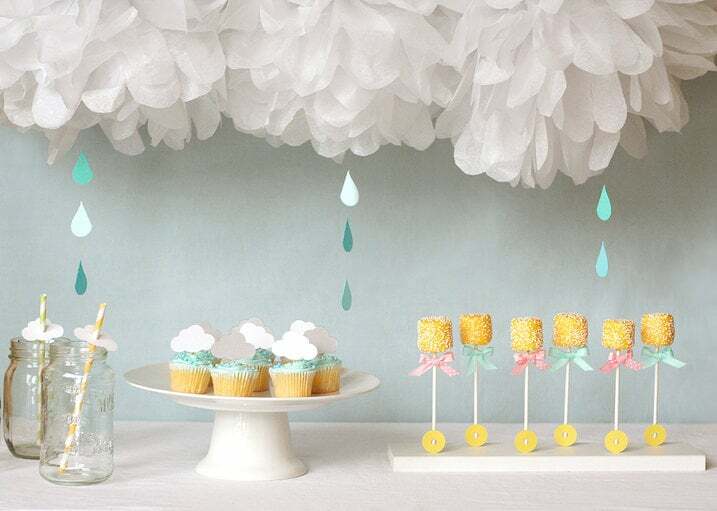 We love sprinkle showers for experienced mamas-to-be and this rain-themed soiree takes the theme — literally — to a whole other level! Check out this adorable Sprinkle Baby Shower, the perfect theme for honoring a mom-to-be (again) while updating — and upgrading — her baby gear from her last tot's arrival. 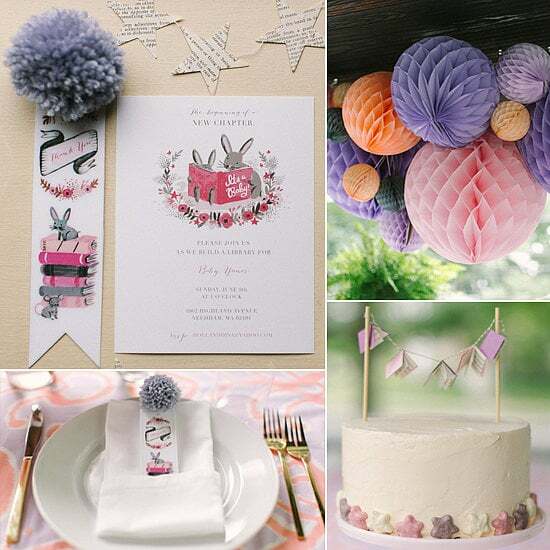 Cristina of Le Partie Sugar is known for creating inventive events with gorgeous paper goods, and this modern gender reveal party is no exception. 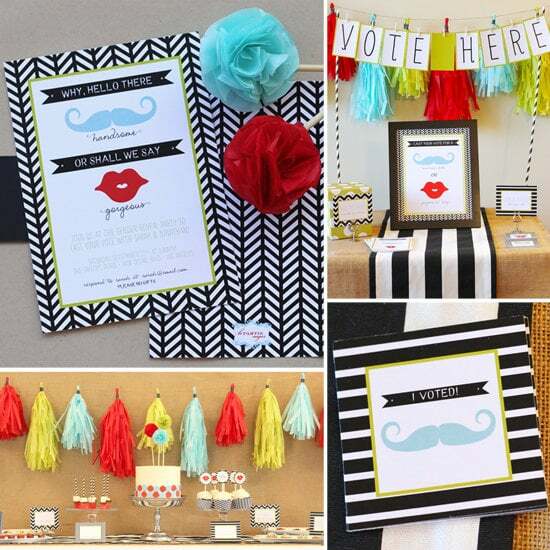 Adorable mustaches and ruby red lips and a clever voting station add style to one Click herecolor-poppin' party designed to lead up to a big reveal. 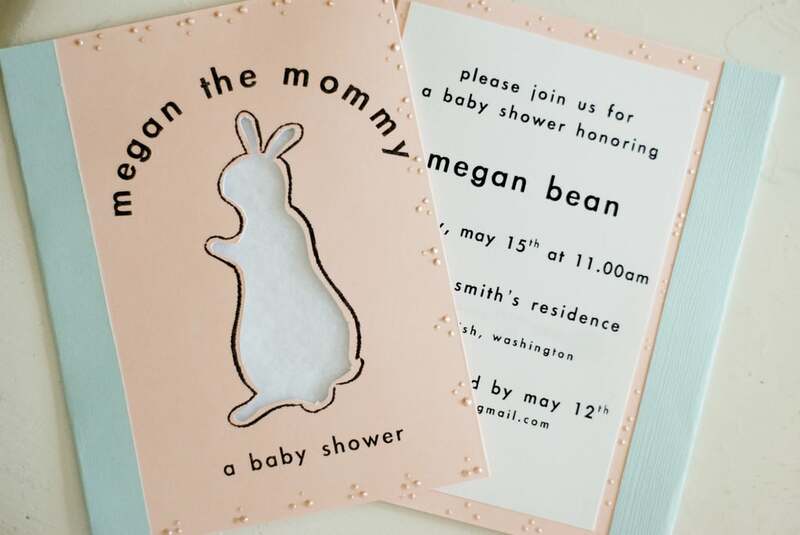 The classic baby book, Pat the Bunny, is a standard on many lil ones' bookshelves — and the inspiration for this lovely Pat the Bunny Baby Shower. This insanely beautiful vintage newsprint-inspired shower proves that, when it comes to baby showers, blue, pink, and pastel doesn't have to reign. Chic, understated grays can have just as big of a style impact. 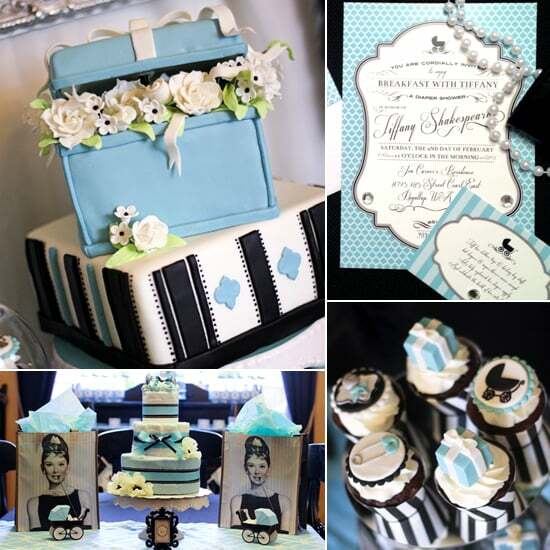 If hundreds of miles or expensive flights have ever kept you from celebrating a friend's special occasion, you're likely to love this Baby Shower in a Box concept as much as we do. Put down the umbrella and celebrate the sun! 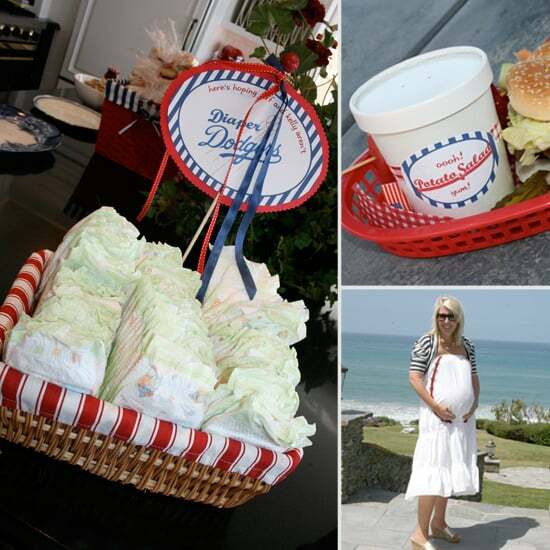 A celebration for a mama-to-be may call for a shower, but it's usually filled with sunshine and bright smiles. 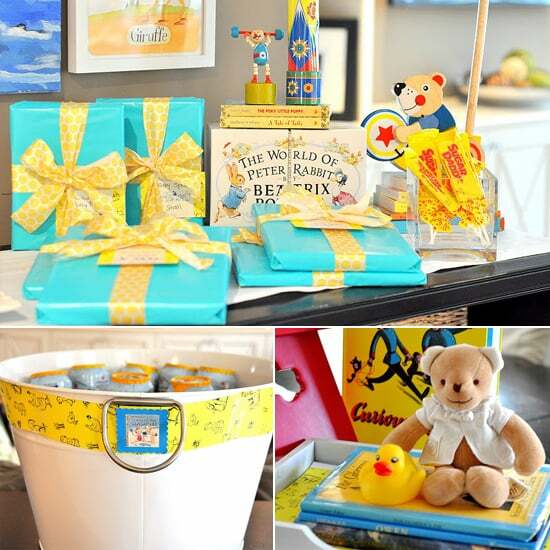 This sunshine baby shower is featured in Party Barn Kids' website along instructions for re-creating the sophisticated party on your own. 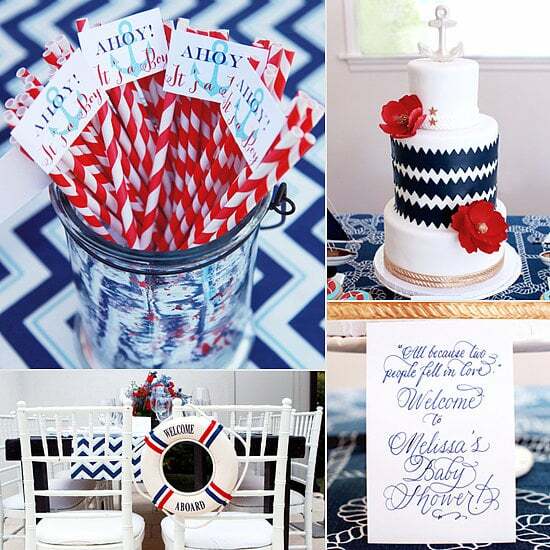 If you've ever been on a boat, near the ocean, or just have a thing for seafood, this nautical baby shower is seaworthy perfection. Using the iconic rope-wrapped anchor as a jumping-off point, the vintage-inspired party came together in shades of blue, off-white, and a bit of red. Gorgeous desserts, messages in a bottle, and the cutest crab cookie favors ever are just some more of the enviable shower elements. 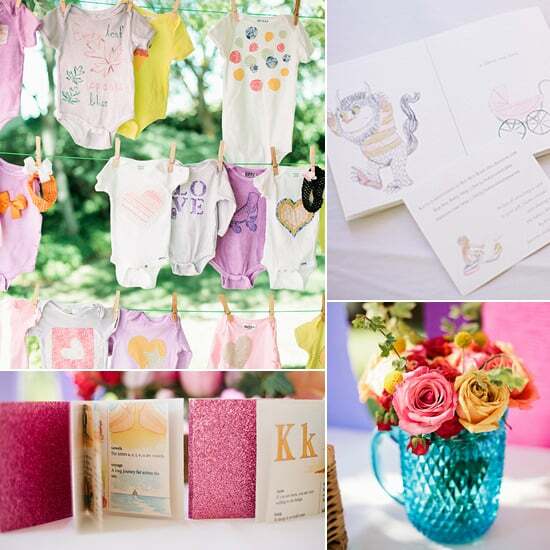 Classic children's books seem to have a knack for inspiring adorable baby showers, and this event, thrown for Katie Vowels, the creative talent behind Katrina Louise Photography and now mom to baby girl Rowan, proves it! We love how this shower put Click herea modern spin on classic kids' books by incorporating glitter, girlie colors, and even a DIY onesie decorating station. Starting with lollipop invitations and a bubble machine that greeted guests at the door, the theme for this She's About to Pop Bubble Baby Shower was also carried through to the menu — which included POP 'ems, POPcorn, soda POP, and more. Inspired by LilSugar's Wishes for Baby! — a fill-out keepsake — this Heirloom Baby Shower was as sweet as can be without a lot of bells and whistles. 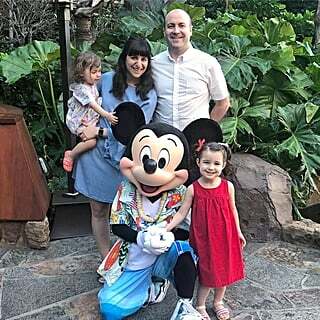 It's no surprise that a baby shower thrown for Katherine Kallinis Berman, the co-owner of Georgetown Cupcake and the co-star of TLC's DC Cupcakes, was filled with sweet treats and adorable decor. 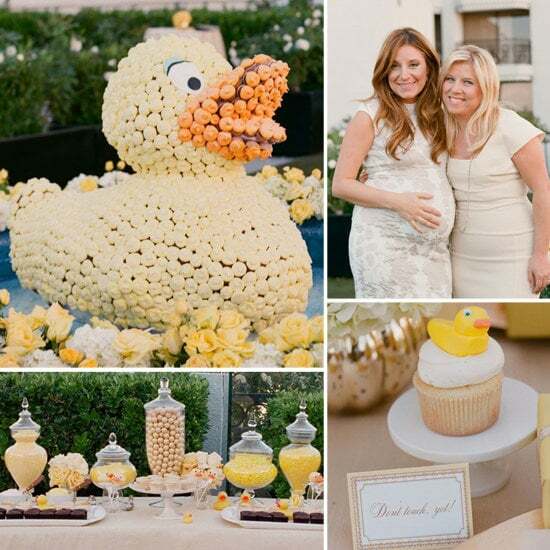 But we didn't expect a luncheon that pretty much redefines our image of a rubber-ducky-themed party for a mom-to-be! There's a lot of learning to be done when a new baby comes along, and when the mama-to-be is a teacher, there isn't a more appropriate theme than a School-Themed Baby Shower. Goodnight stars. Goodnight air. Goodnight noises everywhere! 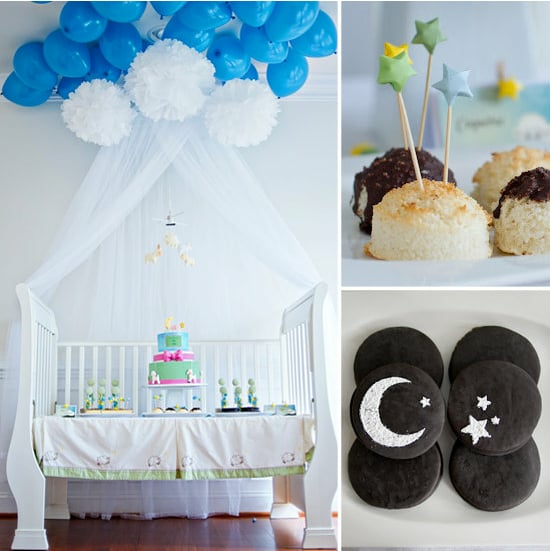 Goodnight Moon, a bedtime classic and a staple in many nurseries, provides plenty of inspiration for a dreamy party theme — like this Goodnight Moon Baby Shower. 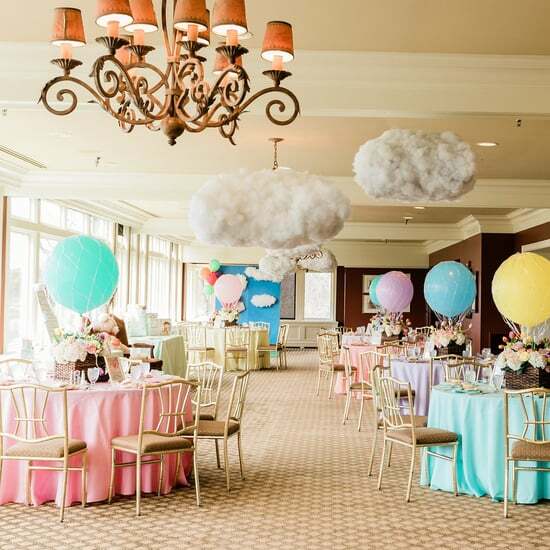 It's fairly unusual to plan your own baby shower, but for event planner Kristen Janes of Kio Kreations, it meant she got the party of her dreams. "I have always wanted to have a classic children's book-inspired baby shower, since I have a degree in illustration and have been collecting children's books for years," says Kristen. "I wanted to start a collection for my soon-to-be-born daughter." 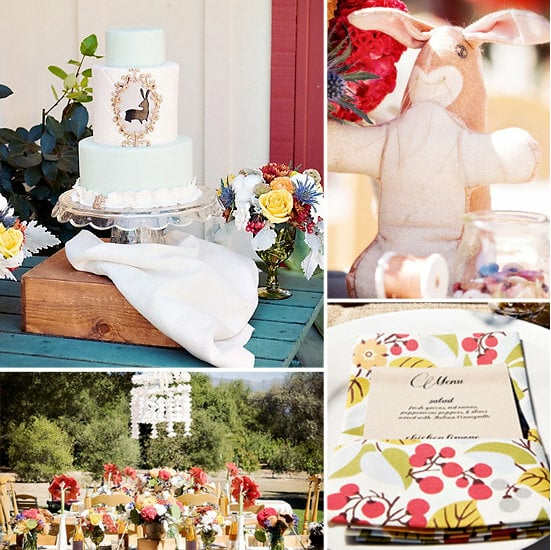 Tables inspired by Eric Carle, Beatrix Potter, Dr. Seuss, and Little Golden Books introduced the theme to guests through flowers, decor, and food ("green egg salad and ham sandwiches" and "fruit salad made with leftovers from a Very Hungry Caterpillar" were just two offerings). Just because a shower is small in size doesn't mean it can't be big on design. This springtime "sprinkle" for a friend's second baby featured a pastel palette — perfect for Spring! While a hurricane and a earthquake (seriously!) threatened to derail this beautiful baby shower, the party prevailed! The lucky mom-to-be, Courtney of Merriment Events, was honored with a bright, beautiful affair in shades of pink, yellow, and orange. 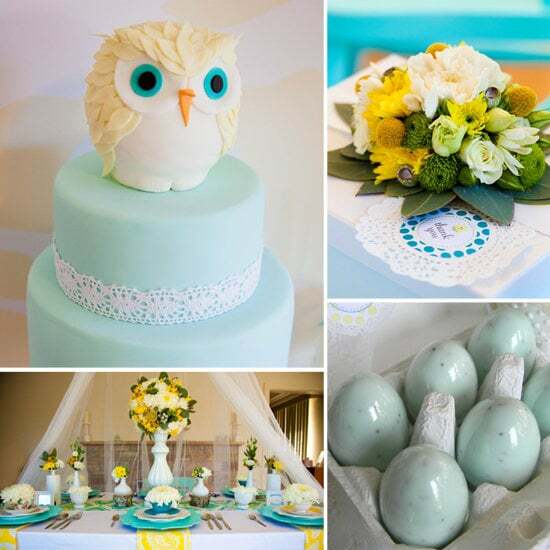 Leoni Jena of Just Call Me Martha used The TomKat Studio printables to create an adorable owl-themed baby shower using some gorgeous, vintage-inspired florals, lovely sweets, and a beautiful tablescape. Throwing a baby shower for a mom-to-be who just happens to be a teacher? Get inspired by this absolutely beautiful, retro schoolhouse shower with a "G Is For Girl" theme. 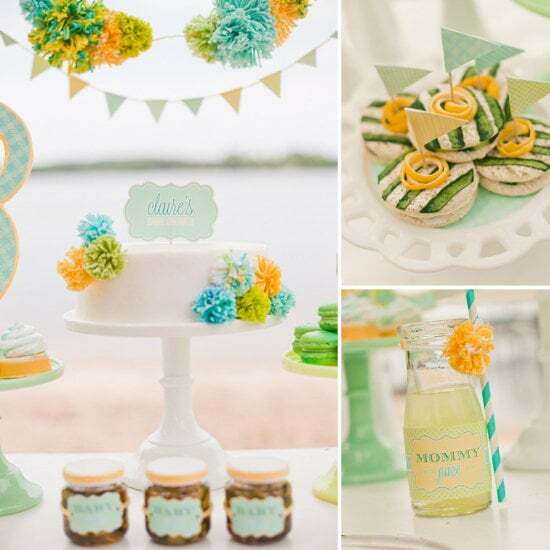 Created by event designers Anders Ruff, this beachfront event is a fresh take on a gender-neutral baby shower, complete with yarn poms; hues of mint, aqua, lime, and yellow; and lovely printable paper goods. 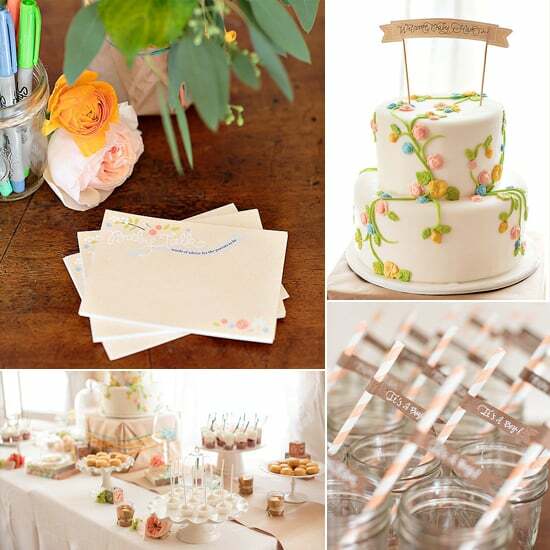 Sometimes all you need is one showstopping detail to take your baby shower from blah to wow. 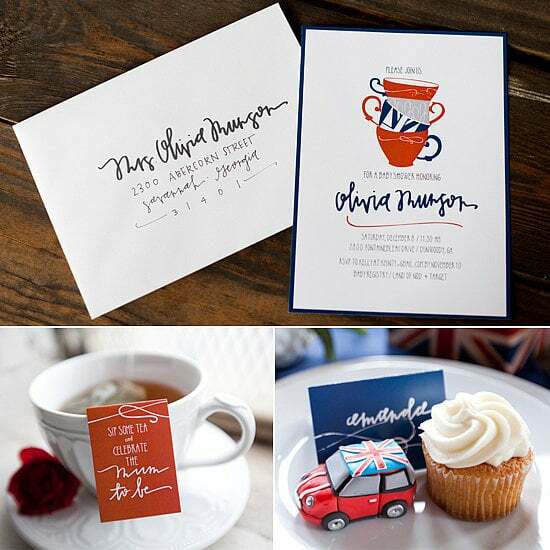 In the case of this orange-and-blue shower, it's all about the letterpress paper details, created by Sabrena of Dear Lola for a shower she cohosted for a friend. Sabrena went all out with the paper suite, designing invitations and registry cards, thank-you cards, "it's a boy" straw tags and address labels, and even coasters. Add in some famed cupcakes, a DIY tassel and name garland, and a cute advice station, and you have one simply sweet shower. 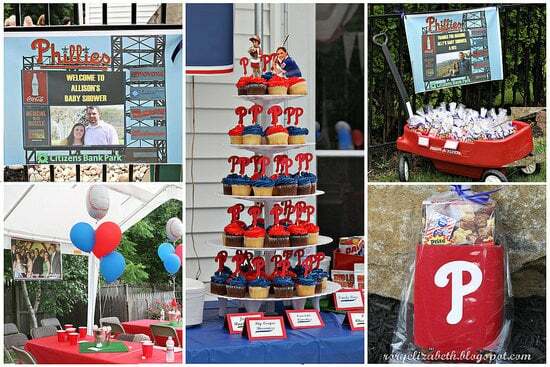 When an avid baseball fan found herself expecting a baby boy, her friends knew exactly what kind of shower they needed to throw her — a Philadelphia Phillies-themed party! 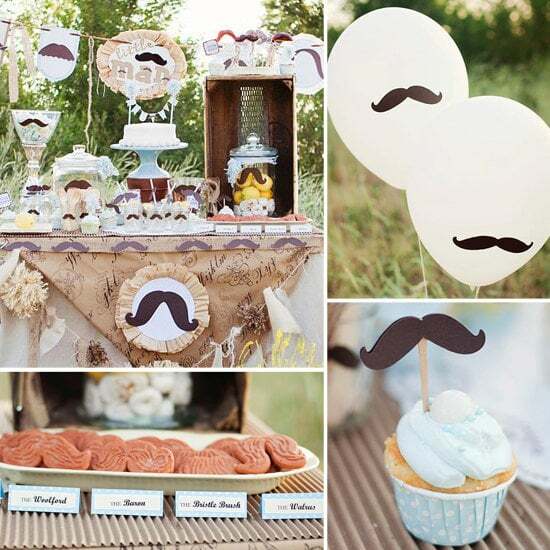 Jessica of Quilted Polka Dot, a mom of two and awesome Etsy shop owner, created this adorable mustache-themed baby shower for a client who wanted a mix of the fun mustache trend with a dash of vintage. 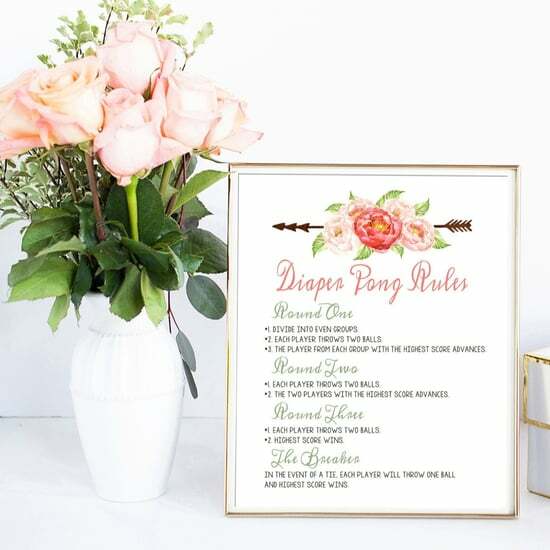 By mixing in some hard edges (corrugated cardboard as a table runner, wooden crates) with the softness of ruffles, lace, fabric, and poms, Jessica created a truly unique event. 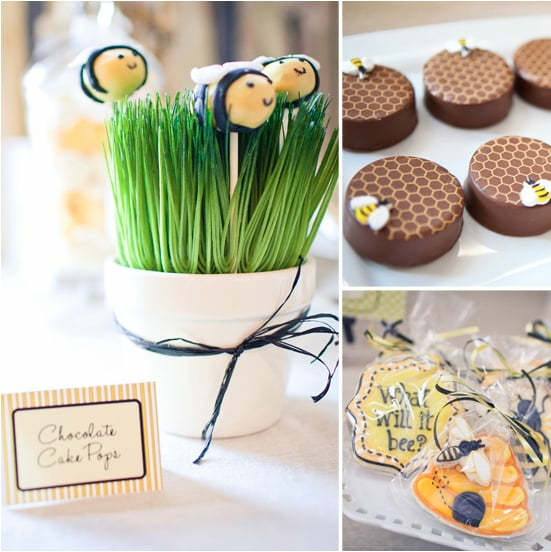 This bee-themed gender reveal party is jam-packed with sweet bee and honeycomb-inspired desserts, and decor ideas. 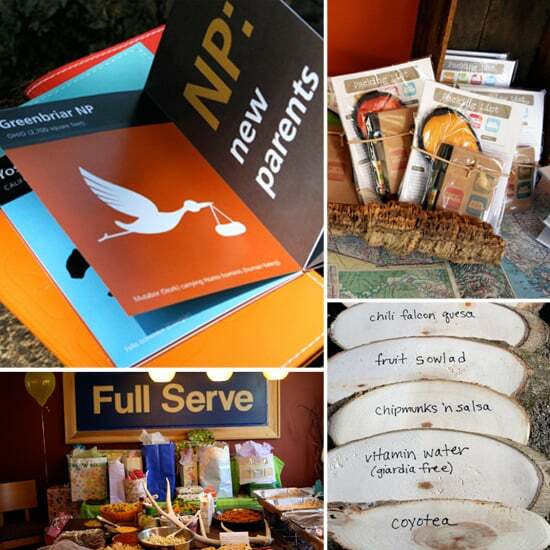 Adventure hits close to home with a national park-themed baby shower! Passport invites were sent out, and included things like a shower itinerary, arrival logistics (comfortable shoes, water and bear bells are recommended, and use caution if packing in edibles), an equipment/survival gear list (a.k.a. registry info) and GPS coordinates. Go bananas! 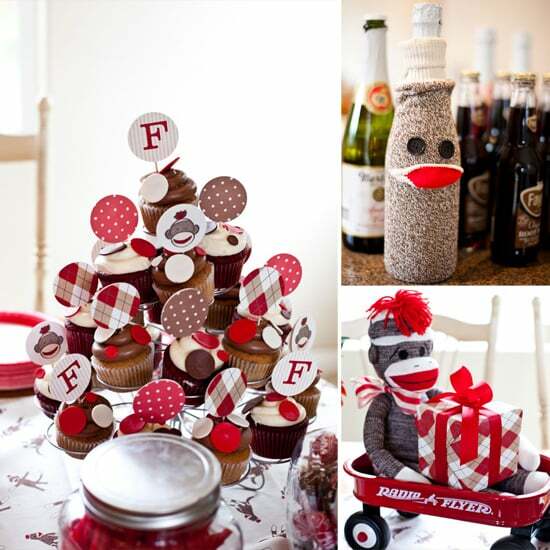 Vintage sock monkeys in red, brown and white made this Sock Monkey Baby Shower unforgettable. 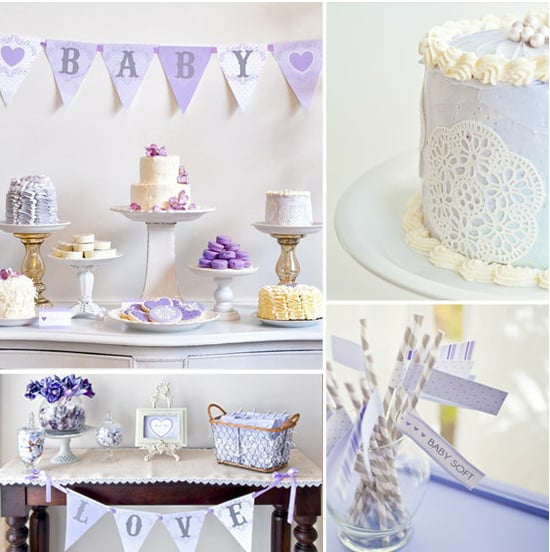 This Baby Love shower, had not one, not two, but five inspirational cakes, lavender bouquets, and sweet paper details to celebrate a baby girl! 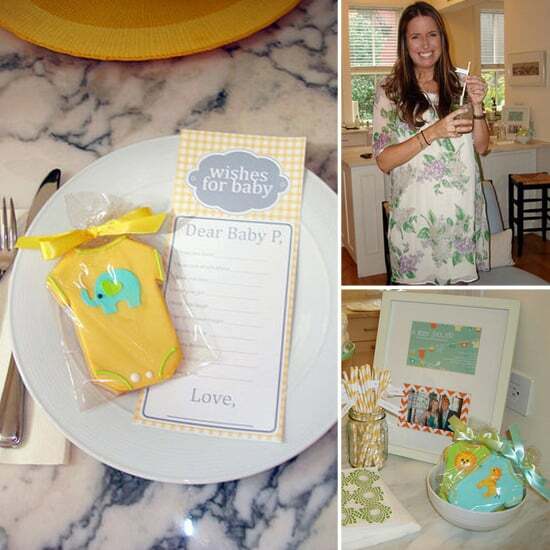 When Jessie of Lilyshop started planning a baby shower for a close friend, she knew she had to think beyond the typical carriage-shaped cookies and onesie decorating games. Instead, Jessie took her inspiration from Morocco, creating a global, girlie evening shower complete with fab flowers, rich shades of orange, pink, and gold, and even a henna tattoo artist! 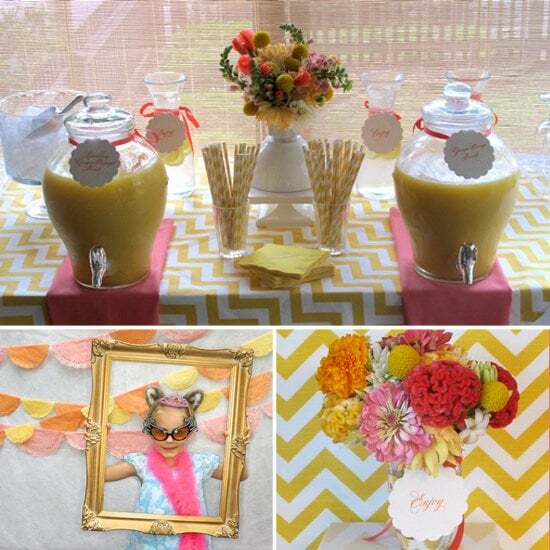 Who says a baby shower must be filled with pastels and frills. 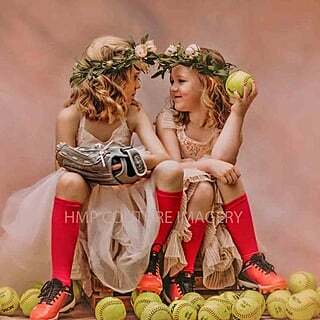 When Cakes Likes a Party blogger Annika Lawrence threw her baseball-loving brother and sister-in-law a ballpark shower that was a guaranteed home run. An experienced mama doesn't need a full-blown baby shower but she does deserve a celebration — and a few baby gear updates! 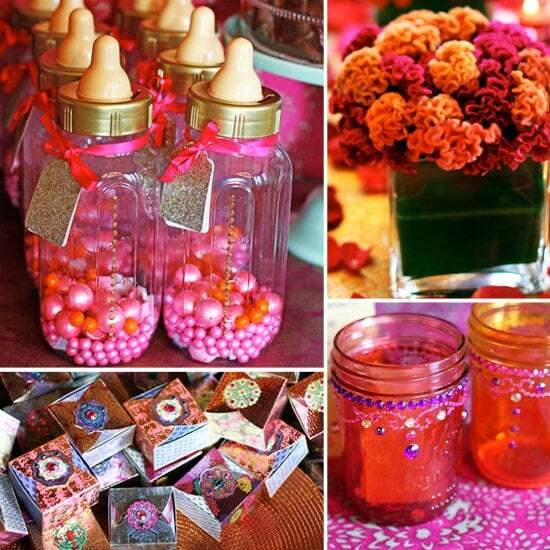 We loved this sprinkle baby shower theme for second and third time moms. 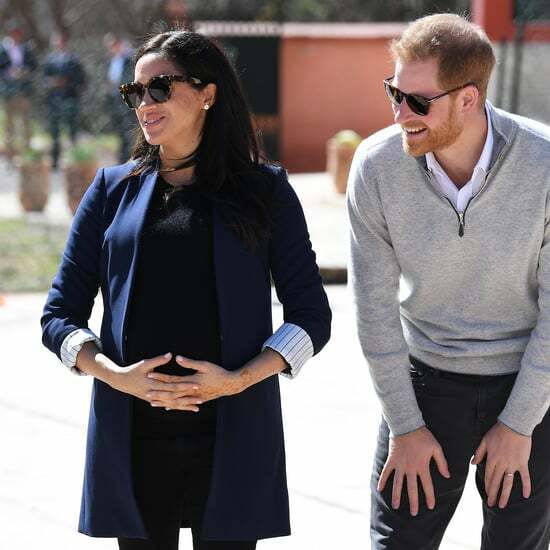 Many expectant couples prefer a coed baby shower — to include the soon-to-be-dad and other male friends and family members. 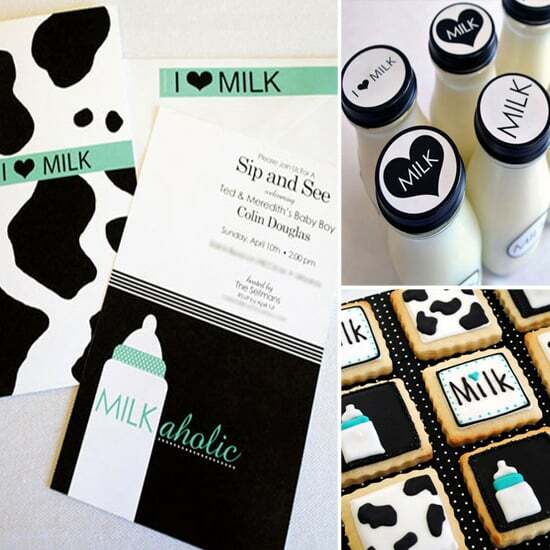 This "Milkaholic" Coed Baby Shower was a big hit with our readers. 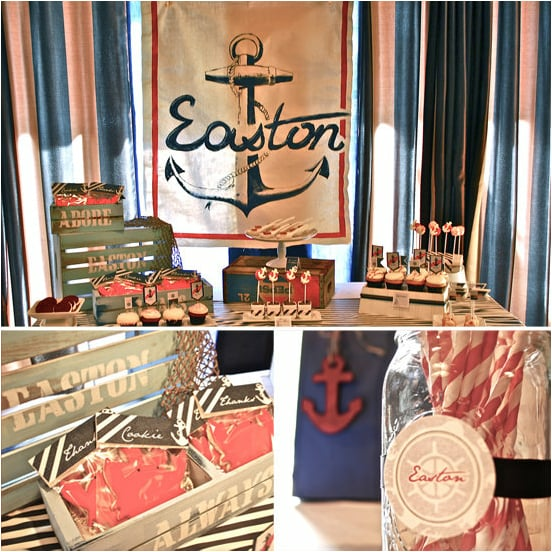 With custom cookies and a milk bar, this shower was a huge success with the gentlemen and the ladies! 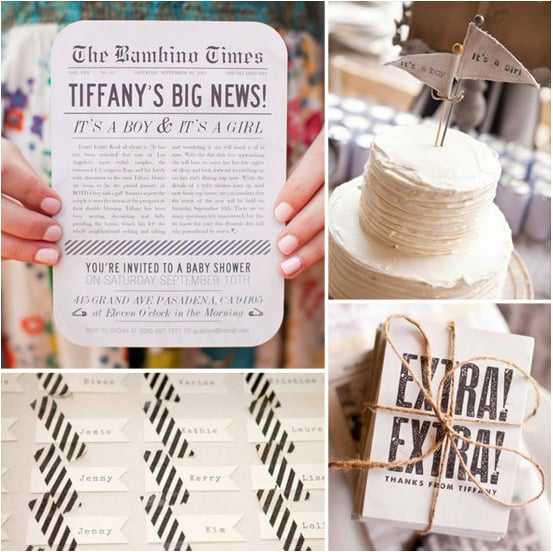 Baby showers come in all shapes and sizes and few are receiving as much attention these days as the gender reveal party. 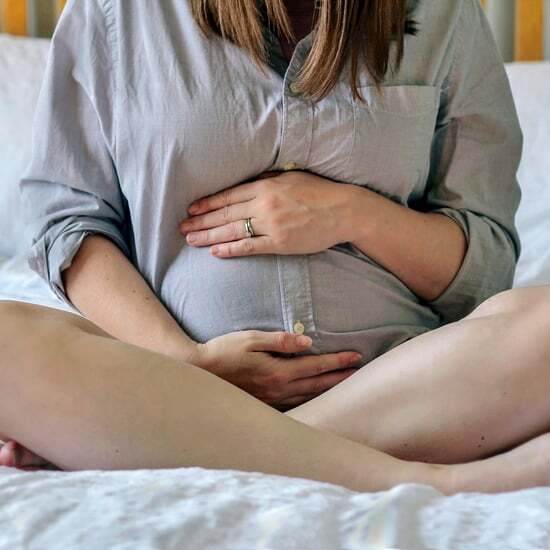 Couples looking to bypass the traditional shower parties, and those looking for another reason to celebrate, are bringing family and friends together to witness the unveiling of their baby-to-be's gender. 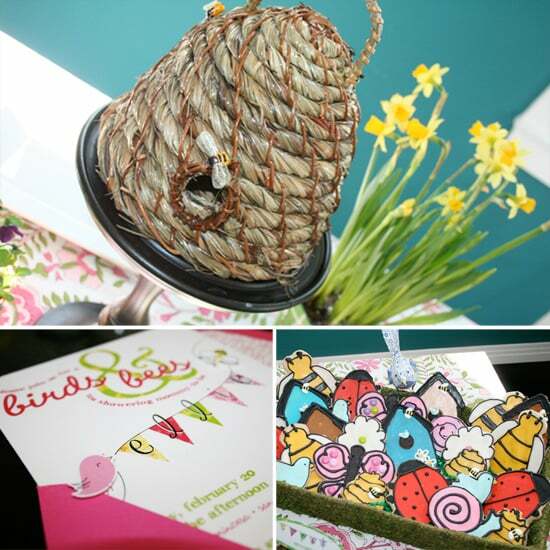 It's safe to assume that if you're throwing a baby shower for someone, they know a thing or two about the birds and the bees! But the cheekiness of a Birds and Bees Tea For a Nesting Mama-to-Be is too cute to pass up. The classic British tradition was the inspiration for this classic high tea shower. When baker and event designer Jenny Keller was asked to plan a shower for her cousin, she knew she had to go the vintage route. By scouring secondhand stores, flea markets, and estate sales, the woman behind Jenny Cookies was able to find everything she needed to create a truly classic shower. 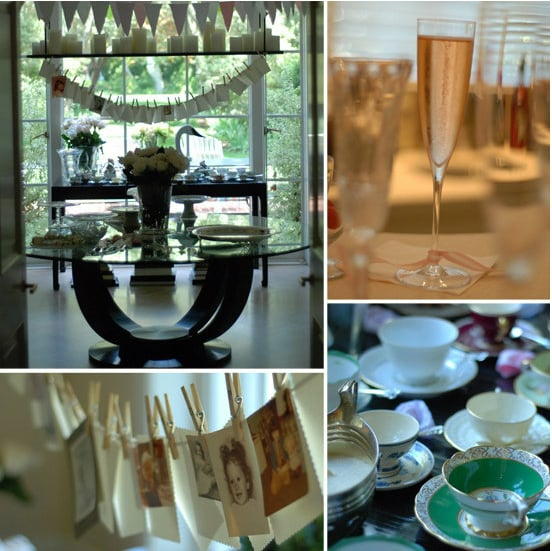 The royal baby wasn't the inspiration for this British baby shower, but it was certainly a royal affair. Amanda Ready from Atlanta Event Studio created a shower fit for a prince by mixing rustic farmhouse tables, wingback velvet chairs, and lots of English extras! 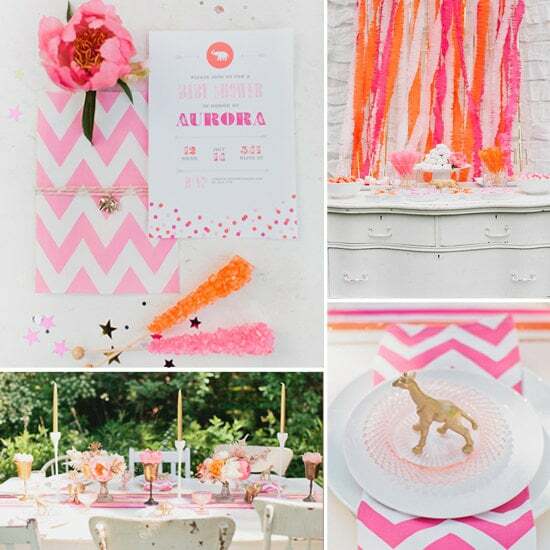 Little lambs, vintage decor, an ombré balloon backdrop, and a big gender reveal? 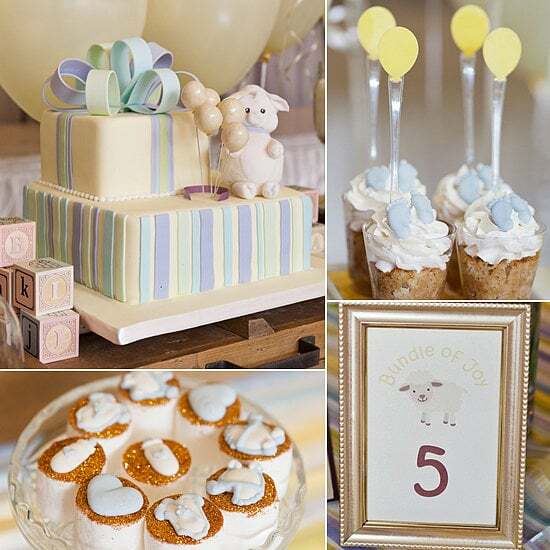 There is so much to love in this adorable baby lamb shower thrown by Diana Pires of Truly Yours Planning, who was inspired by pastel colors and her favorite little animal. When Anneliese of Aesthetic Nest was asked to plan a party for two expectant women, she knew she had to incorporate the beloved Little Golden Books. The mother and designer scoured thrift shops for children's books and classic toys and used design skills to create amazing paper accents. 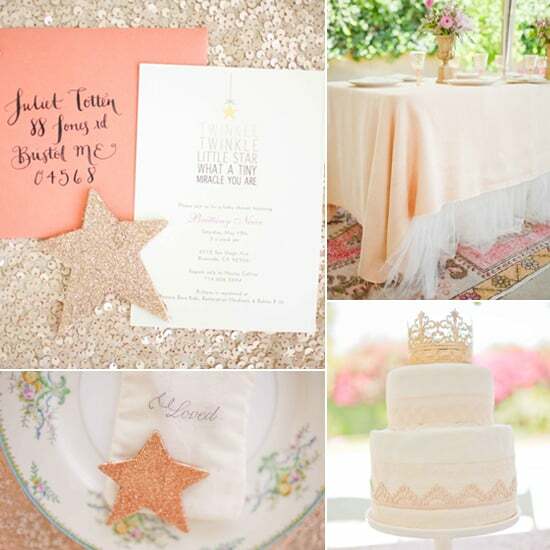 We love every aspect of this storybook shower, and you will too! 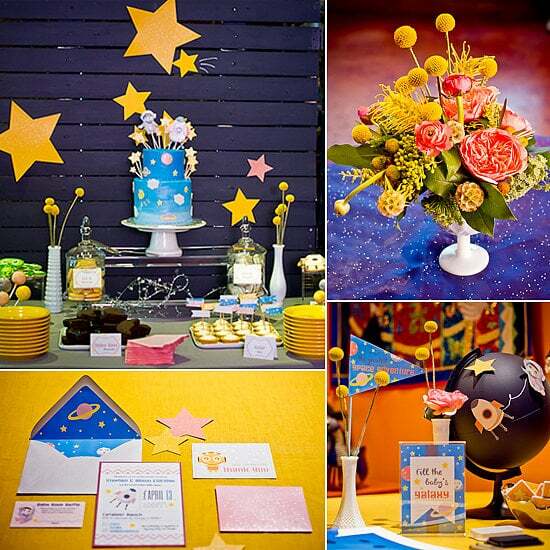 While Taylor Sterling, the stylish founder of lifestyle, fashion, and beauty blog Glitter Guide, loves everything sparkly and color-filled, she decided to go in a different direction for her own baby shower. Succulents, a gorgeous display of sweet and savory eats, and a bar filled with girlie cocktails are just some of the highlights of this gorgeous but subtle shower. Ahoy, baby! Cool table linens and flowers, clever signage, and a gorgeous cake were just a few of our favorite elements from this seaside shower, perfect for a Summer birth. 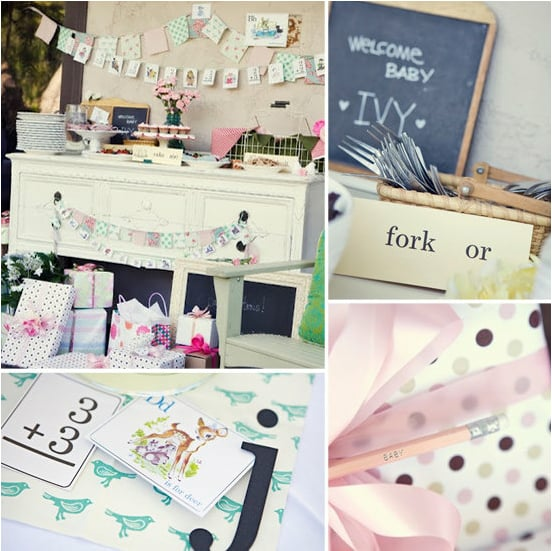 We're beyond smitten with the style and theme of this build-a-library baby shower thrown by Dina Holland of Honey & Fitz. Diane created this breathtaking shower by using lots of store-bought food, repurposed furniture, Rifle Paper Co. printables, and some adorable — but doable — DIY projects. 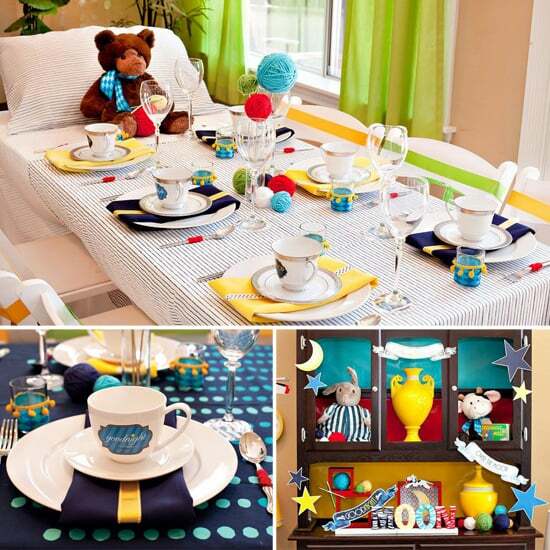 When it comes to hosting a themed baby shower, there's a fine line between subtlety and taking the motif a bit too far (especially when the honoree's an adult!). We think that this absolutely elegant Winnie the Pooh shower hit the nail on the head. 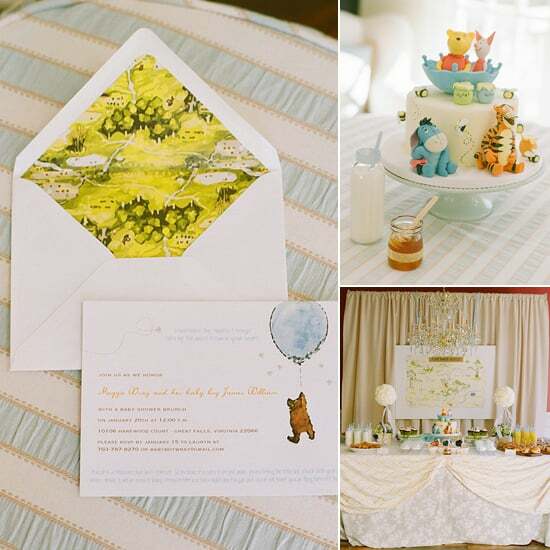 Soft colors, dreamy watercolors, and a menu of bite-size comfort foods made this grown-up journey to the Hundred Acre Wood an especially memorable affair for the mom-to-be and her lucky guests. 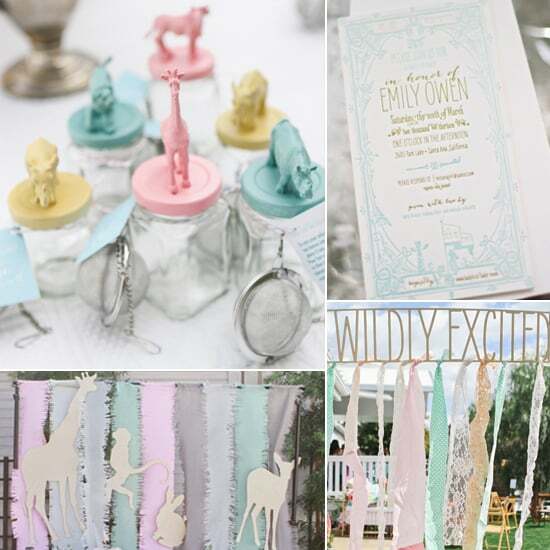 We love how this baby shower mixed quirky with cute in such a beautiful way! 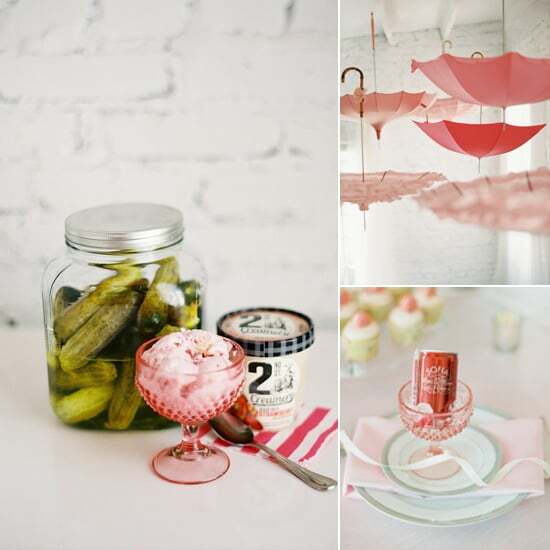 This pretty-in-pink shower featured so many inspiring elements, including a collection of pink vintage umbrellas hanging from the ceiling (a tribute to a "shower") and a "craving station," which acted as a food table and a game (guests ranked the order of the items they thought the mom-to-be would crave the most). You might think an outer-space theme would only work for a baby boy, but this awesome shower proves that space is equally girl-friendly. Tiny details, like pink astronaut suits, polka-dot spaceships, and so many more make this a creative and literally out-of-this-world shower. A piece of paper was the inspiration for this colorful shower. Gorgeous decorations, DIY onesies, a make-your-own bubbly bar, and more elements helped bring this watercolor dream to life. With a quaint Orange County, CA, teahouse as her background, Lina Wallace of A Stunning Affair created an indoor garden space and filled it with a vintage beverage station — with the requisite mason jars and striped straws — as well as wooden crates filled with garden flowers, stacked baby books, and sweet china teacups. 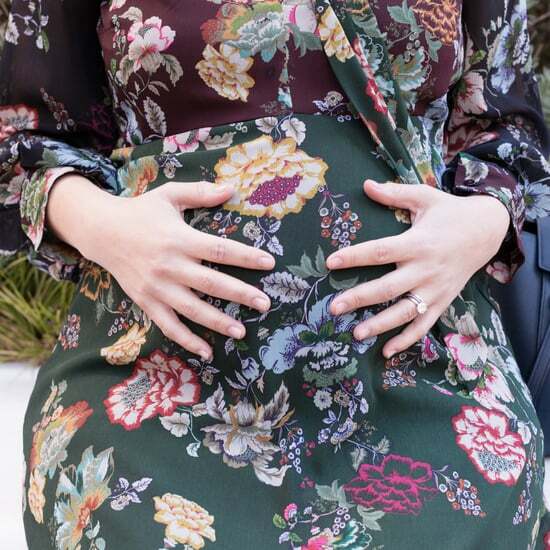 Her floral twist on the vintage theme is one any mom-to-be would love.